Thanks to those who helped with this one. The reason he’d gotten himself into this, ArPharazonTheGolden decided, was because he could never say “no” to anything. The Faerie Draik perched on the edge of the bed in his cabin in a Shenkuuvian sky-ship, staring at the letter in his claws, not really seeing the words so much as coming to the realisation that he was hopelessly wishy-washy. He’d go along with anyone just to avoid a quarrel—and even then he’d end up petering out somewhere along the way, retreating to the safety of merely existing. Really, he just wanted to sit and read all day. No adventures for him. The world was so much safer from the library of his family’s Neohome. With a sigh, Pharazon glanced out the porthole. It was late afternoon and the sinking sun was turning the clouds golden. A beautiful time of day, by anyone’s standards, but it also meant soon he would have to venture to the dining room on the upper decks for dinner. Pharazon looked back at the letter in his hand and wished the Weewoo that delivered it had been waylaid. But no, here it was and here he was because, in true wishy-washy fashion, he had heeded its demands. Laying back on the mattress, he read the paper for the umpteenth time. How have you been? It’s been a while since I’ve last visited. I apologise for the inconvenience, but inter-kingdom relations and magic studies do tend to keep one busy. Pharazon’s other hand reached for the Lupe Moon Charm around his neck. He and Celice had established a magical connection with it that enabled them to speak with each other instantaneously, regardless of physical distance. It was better in theory than in practice, as they obviously could not interrupt each other’s lives all the time with random conversations. There was also the fact that as Celice had no receiving implement, she had to sustain her end of the conversation solely through her own power, which could be draining. Pharazon had gotten off easy in that regard. He liked finding ways to get off easy. Too bad he hadn’t now, or else he wouldn’t be on this sky-ship. At any rate, that was why she had Neomailed him the message. She probably, he thought, also wanted to make good and sure he wouldn’t conveniently forget her instructions. His eyes wandered back to the letter. Now, don’t try to deny it. I know you’ve been slacking in your magical training. Pharazon groaned and flopped his hand over his forehead. Just like he’d done the first time he’d read this. It’s been two years since we discovered you had magical aptitude. You have got to start doing something about it besides accompanying me to Jerdana’s lectures and nodding noncommittally whenever I tell you to find a teacher. We’ve barely made any progress with you at all. Well, there was a good reason he shied away from practising magic, as Celice’s next paragraph so kindly reminded him. Don’t let everything you learned from Skoll go to waste. I know that situation wasn’t pleasant, but just try to look at the positives for once. I mean, you’re still alive, so that’s something. Don’t ever do anything that idiotic again, by the way. Pharazon’s stomach knotted and he placed his claws over it. A little over two years ago, he and his owner had briefly been prisoners of the Werelupe King in the mountains between Meridell and Brightvale. Terra insisted it had been a valuable learning experience for everyone involved—including said Werelupe King who she now regularly let stay at their house for some reason. 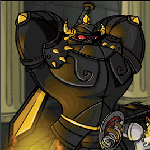 But all Pharazon cared to remember about it was that he had taken a stand, and it had come back to bite him and very nearly destroyed Neopia. And that was no exaggeration. He let out a deep breath and stared up at the cabin ceiling, following the patterns in the varnished wood and feeling the painful memories well up again. In the depths of his fear and despair, he had been befriended by Skoll, the Werelupe Sage, who began to teach him magic with the goal of helping him and Terra escape from the Werelupe Burrows someday. But it all turned out to be a terrible ruse. Skoll wanted to cultivate Pharazon’s magical ability and gain his trust in order to use the Faerie Draik’s power to catalyze an ancient magic sink. He succeeded, and Pharazon had nearly been consumed, but clung to life by the skin of his teeth and took his power back from Skoll, who was destroyed when the magical backlash proved stronger than the Werelupe had anticipated. Whenever Pharazon read about that sort of thing in books, the Neopet involved would always walk away with a new sense of confidence in themselves and a determination to continue battling against the forces of evil. In real life, it just made Pharazon want to lose his lunch. Ever since then, magic held negative connotations for him. It reminded him of captivity, of betrayal, of nearly becoming a phantom. He was not going to dip his claws back into what he had messed up so badly the first time. At least, that was what he kept telling himself. And then of course this had to go and happen. With a frown he read the rest of the letter. That’s why I’m inviting you to accompany me on a minor assignment from Master Seradar. There have been reports of strange activity at Black Keep in Market Town. It’s nothing malevolent, just strange lights and noises in what’s supposed to be an abandoned fortress, and it’s been spooking the Market Townsfolk. As I’m sure you know, they’re mainly merchants, so the Traders’ Guild sent in a request to Brightvale Castle for an investigation by a court-certified magic user. Of course, those sorts of cases go directly to Master Seradar, and as pretty much everyone else is busy with thesis papers, an upcoming mages’ tournament, and an outbreak of Neezles, he tasked me with the job. It’s quite trivial and not at all a high priority, so I’m sure you can handle it. I expect to see you here at Brightvale University no later than the tenth of Running, which should give you time enough to book a sky-ship. Pharazon sighed again, rolled over, and watched the clouds drift by outside. This ship had left Altador’s skyport three days ago, with an estimated arrival date at Brightvale of the 7th Running, five days from now. All passenger ships travelled at this rate, sacrificing speed for comfort and amenities for their hundreds of occupants. It was the same principle as the Lupe Moon Charm, really. All the magic and Virtupets technology in Neopia meant that there were much faster ways to get around, such as portals and starships. But in practical application, portals took an enormous amount of energy to sustain. And starships were still considered esoteric by Neopia at large, with very few on-world resources such as fuel and properly-educated technicians to support them, so they were mainly used for transport around the Space Station and Kreludor. And except in the case of emergencies, no one wanted to pay out the nose for a smaller, faster ship, even though those were capable of going halfway around Neopia in as little as thirty-six hours if the engines were pushed to their limits. So larger Shenkuuvian sky-ships filled the niche of mass long-distance travel at just the perfect intersection of convenience and cost. Naturally, the passenger lines played up the “comfort and amenities” part quite a bit. The largest sky-ships were like flying Neolodges, with formal dinner rooms and live music and swimming pools. There were even a few immense liners that had their own on-board Neomail service, with Weewoos flitting about dropping messages into portholes. The vessel Pharazon’s owner had booked him on was not quite of that calibre, but still nothing to sneeze at. Between the plush carpeting in his cabin, the all-you-can-eat dining room, and the game room on the recreation deck that featured such classics as Meerca Chase and newer releases like Assignment 53, Pharazon would definitely consider this trip luxurious. It was definitely nothing like his family’s usual mode of travel: on the back of Gwyneth, his enormous Petpet Ganuthor. He missed them. Why couldn’t they have come with them? They usually went everywhere together as a family, but when he asked why they weren’t coming, Terra told him that she and his siblings thought it would be good for him to get out of the house and do something on his own for once. Personally, he thought she was mad for letting him go anywhere alone after they’d been kidnapped in Shenkuu. Even having just Hyren with him would have made him feel more secure. It helped that Hyren always carried a sword. Pharazon’s stomach grumbled, and the Draik made a face. He’d have to go get food. Which meant interacting with other Neopets. Maybe, he thought, he should have just bought fifty packets of Blueberry Gateaux so he could stay holed up in his cabin the entire time, reading. He glanced down at his luggage trunk full of books. Well, just being stuck on a boat with a bunch of other Neopets didn’t mean he was forced to socialise. Sliding off the bed, he snatched up his copy of Why Red Moltite Rocks and trudged into the hallway. All he had to do was let Celice drag him along on this inconsequential errand, and then he could book the next flight back home, pretend like none of this ever happened, and go back to being comfortably noncommittal. The universe, as he was most uncomfortably going to find out, had other plans.